Everyone once in a while a DIY project sneaks up bites me from behind. It’s not even on my radar and then suddenly it’s consuming my every thought. That’s what it has been like for the last few days with our garage. Our garage is not exactly the prettiest building ever constructed and we’ve done absolutely nothing to it since we bought the house more than 11 years ago. Actually, when we had the home inspection done we were told the garage roof needed to be replaced immediately. Long story short, by that point the previous owner had changed her mind about selling the house and was doing everything she could do to get us to back out of our contract, so she refused to offer any concessions for anything found in the inspection. To be honest, I’ve been of the mind that fixing the garage would be ridiculous. Frankly, the thing looks like it’s going to fall down. Turns out I was wrong. Two contractors and Mr. Much More Patient have informed me that garage is structurally sound. It’s just ugly. I think this picture proves my point. See that roof? There is an entire colony of moss growing up there. And that lovely green hue continues around the base too. That motion sensor light between the garage doors leaves a little something to be desired too. And you might notice the garage door on the right looks like a large animal is trying to escape. That’s because I backed up into it when it was closed not once, but twice. 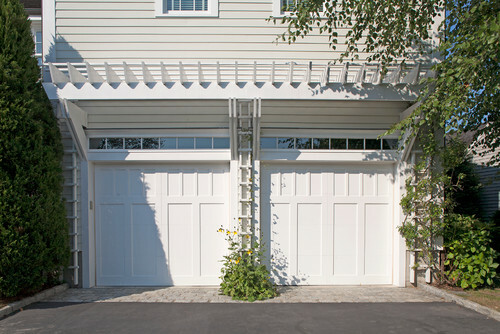 Other than that, the garage doors aren’t too bad so we’ll probably just keep them for the time being. That red building looming behind is the neighbor’s garage. I start thinking that a new roof on that ugly garage is not really going to help appearances much. I also realize that I’m a little irritated about how ugly it is. Given it’s location, it’s actually the first thing you see when you pull in our driveway. Yep, pull into the driveway, and this is the site that greets you. Ugh. 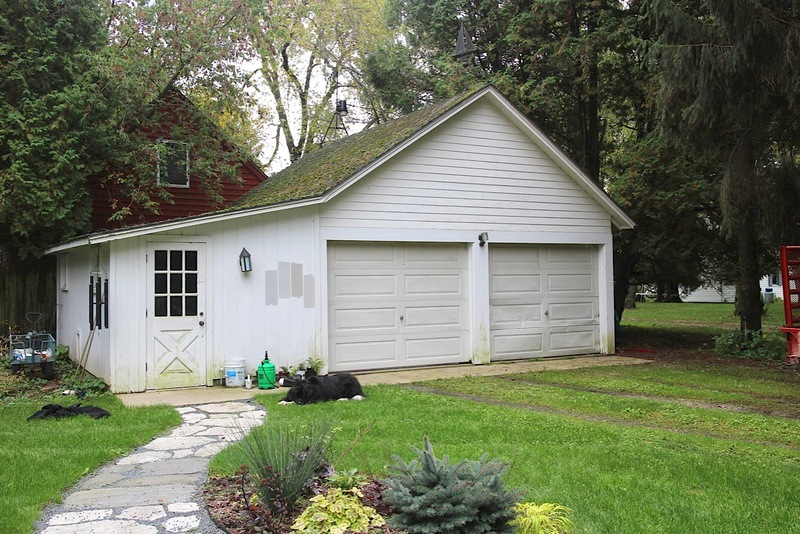 I start a blog post asking all my lovely readers to weigh in on what we should do with the garage. The big question is if garages should always match the house, even if, as in our case, the garage is detached and actually quite far from the house. 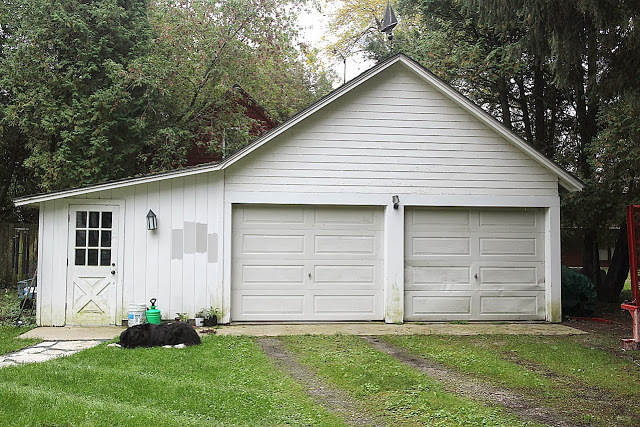 By the time I’m done writing the blog post, I’ve already answers my own question: I’ve decided it is OK to have your garage be a different color than the house, so long as it coordinates. 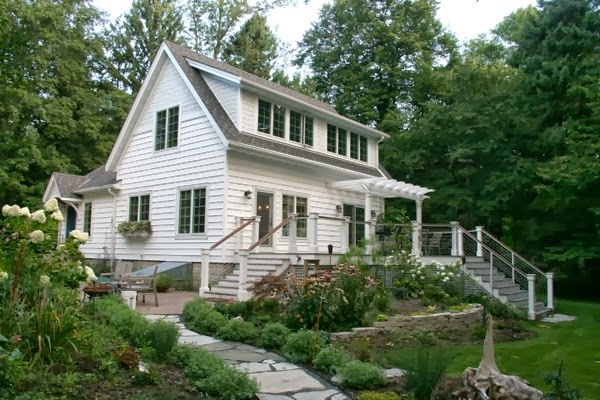 The color scheme I have in my head is gray and white like the deck on the house. It’s a horrible, gray day so it’s obvious there’s not a lot of outside activity happening, but by 10 a.m. 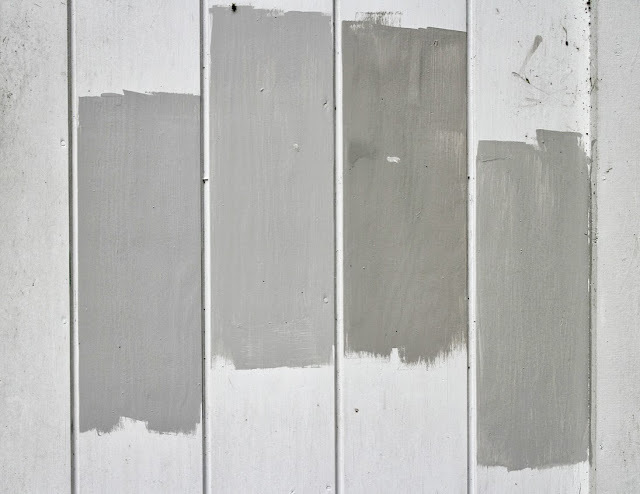 I already have paint samples up on the garage (fortunately I’m well stocked in gray paint samples from previous indecision). Sometime overnight I’ve also decided that we need a small pergola on the garage just to add something to it. If we do it in the same style as the one on the deck I think this could be another unifying element. Mr. Much More Patient is not a fan of this idea. To the point where he declares that he will have no part in a garage pergola. 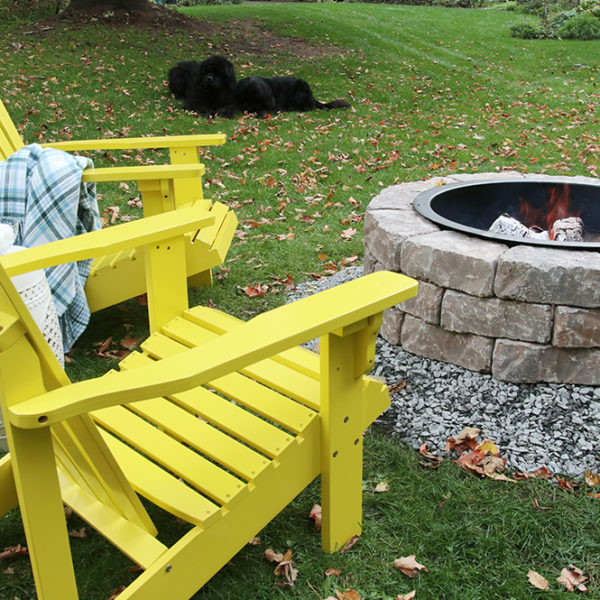 Since the one on our deck is a relatively simple design, I think I can replicate it on a small scale myself and I know he’ll come around once it comes to actually putting the thing on the garage. I have realized that straight men do not understand pergolas. In fact they get downright cranky about them. Then they demand to know what purpose they serve. Unless you live in a really sunny place, the answer is “None.” Pergolas serve no purpose most of the time. But they are pretty, OK? And if this garage isn’t a candidate for a little bit of pretty, than I don’t know what is. 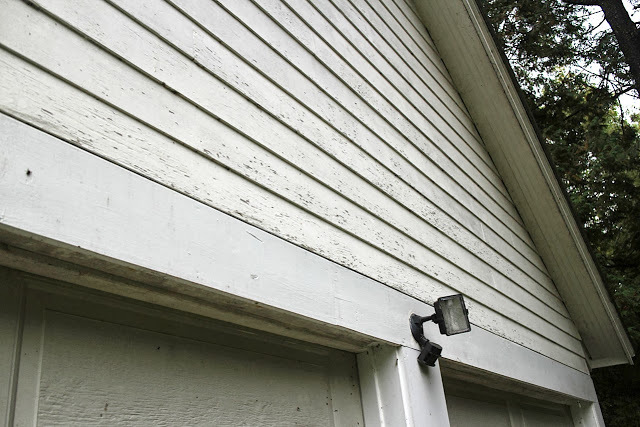 Looking at the garage I also realize that we need to trim out the garage doors a little better and replace a couple of trim boards that critters have eaten in order to get in the garage. Since we spent most of the day stacking wood (we moved the wood pile and stacked all the wood from the trees we had taken down in spring) I had a lot of time to think while stacking nearly three cords of wood (good exercise but holy smokes my back is feeling it). The realization that this garage project is going to be no small feat is dawning on me. Also, our neighbor, who happens to be the contractor who is going to do the roof, tells me that it’s already getting sketchy to paint at this point. Particularly on our very shaded garage. There’s a chance we could get it done, but as you can see, there is a lot of prep work that needs to be done to paint: pressure washing, scraping and priming. The colors I sampled were, from left, (all Benjamin Moore) Smoke Embers, Silver Chain, Gray Huskie and Silver Chain again. I’m leaning heavily toward Smoke Embers but Silver Chain is a close second. You can see that the prep work will be no small task. So this MIGHT happen this fall, but if I think realistically about it, it seems unlikely. And that makes me sad. It also makes me wish I hadn’t stuck those paint samples right on the front of the garage. That’s the path this rapid-fire idea took. In four days it went from lightbulb to excitement to a heavy dose of reality. But a girl can still dream and plan for spring, or if we’re really lucky, fall. 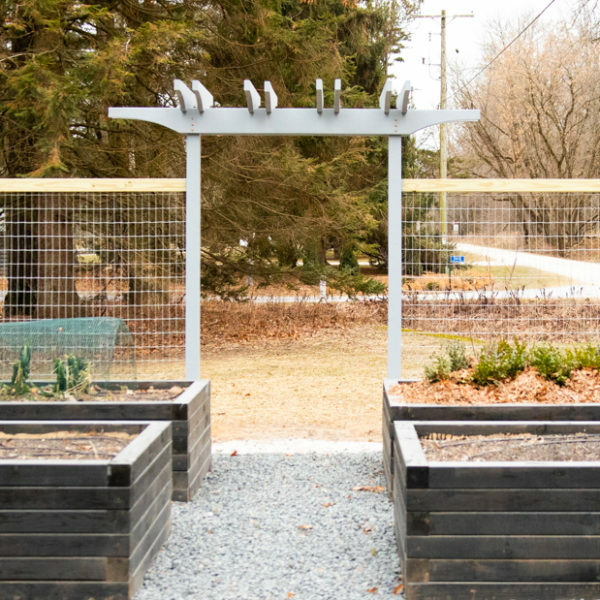 next post: The Garden Appreciation Society Week 18 — Link ’em up before they freeze! How much more warm weather will you receive? I think that you could maybe paint in the fall and add the pergola in the spring? I am honestly happy that you are not tearing it down, I really like the A frame and think that you can do great things with it! BTW, your politics comment over at the blog was aces. I love your garage! It has loads of potential! A new roof, coat of paint, the pergola and new garage doors will make it perfect! 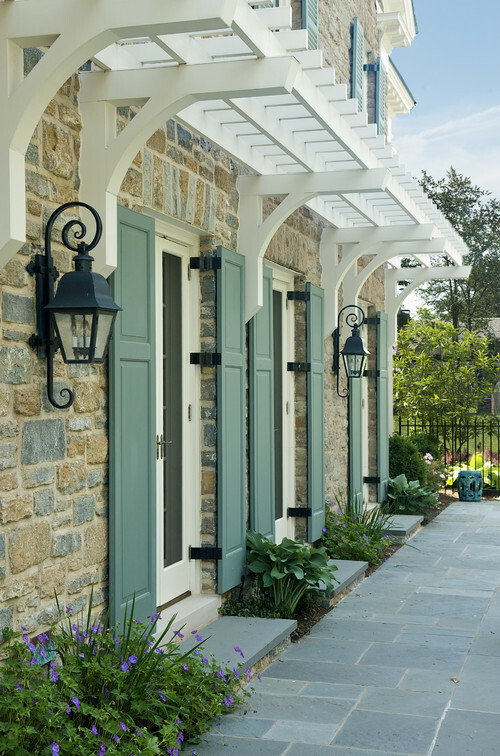 Get the barn door style with some windows…it will match the side door. That peak is a perfect spot for a big Christmas wreath. I am actually considering a new garage myself…going to share yours with my husband. I love how the side storage area adds some interest and dimension. He wants to put up a big honking 4 car garage so I need to do my homework and find something that will work for both of us! Good luck with your project! Keeping the garage in it's current style is wonderful and I love the Smoke Embers colour you've chosen, especially with white trim. Then you could add a pop of colour for the door. And the pergola will add so much!! Once it's done, you'll wonder why you ever considered getting rid of it. Go for it! It is exactly what I was thinking of doing on our garage here on LI. Again it is detached and set back from the house, but not as interesting as your garage. It would look wonderful with the existing cross hatch door you have and a pair of new light fixtures. I am also doing the garage roof in metal with a cupola and weather vain. Can't wait to see your transformation. Your pics made me think of Jeff Epping's garage in Madison. I posted some pix here: http://eachlittleworld.typepad.com/each_little_world/2010/08/xxxxxx.html . New paint colors on the building plus trim and that door will do wonders. Distract from the problems that can't be quickly cured! Our house is split level and the garage is always what you see first. And the work yard of the garden is always where people want to enter. Thank you, Sarah! 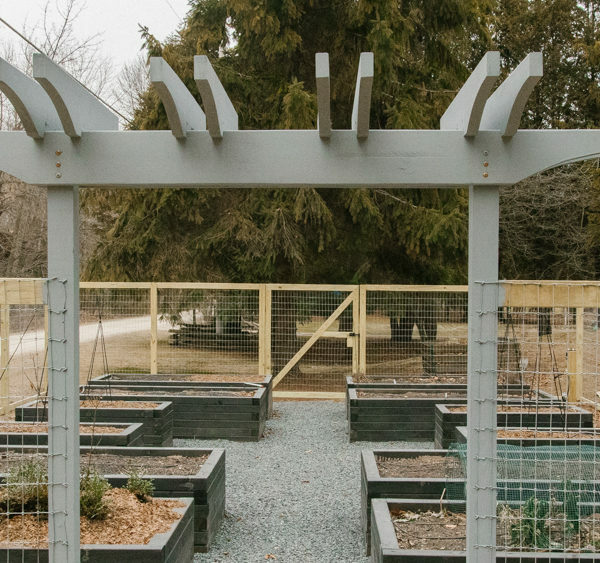 I’m going to disagree with you on the pergola vs. arbor discussion (which suggests that arbors are freestanding and pergolas are usually attached to a structure), but it doesn’t matter what you call it as long as whoever owns it loves it, right?